Recently I visited The Charleston Museum in South Carolina USA. It is one of the oldest museums in the United States. Founded in 1773 and opened to the public in 1824. I was hoping to see the natural history exhibit with special interest in fossils and minerals on display. Unfortunately, these areas were undergoing remodeling during my visit. In the main entrance area, they did have some minerals and this fossil was on display. 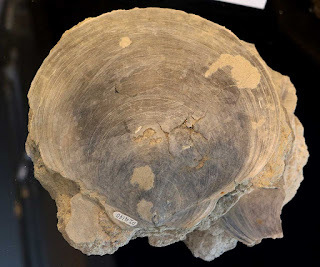 The picture above is an Amusium mortoni Ravenei 1844 saltwater clam fossil. Fossil dates to the Pliocene epoch (Neogene Period) and was found in Charleston County South Carolina. Outside the closed Natural History Gallery was a model showing what the renovated area will look like when it re-opens September 23, 2017.